Fall is finally here (yes, I'm one of those), and as I think about the cold days to come, I think of all the hearty dishes it was too hot to cook and eat during the warm summer months. I am still finding my way down to the green market. The season has definitely changed down at the market. The tomatoes, corn and peaches have been replaced with apples, pears, and pumpkins, and zucchini and summer squash have made way for acorn, butternut, and a host of other, less familiar, winter squashes. As I got older, I developed more of a taste for cooked cabbage, especially in soups and with corned beef. Cole slaw was still the preferred use, but every once in a while I would enjoy a wedge of boiled cabbage with the pot roast my mother served for dinner. Later, I started hearing about this thing called stuffed cabbage. But it wasn't until I moved to Chicago and went to the Red Apple that I had the chance to try it. And loved it. And flirted with the thought of making it. I even looked at some recipes, but never got around to it. It seemed like a lot of work, so it stayed on my "maybe one day" list. Until I saw the most beautiful baby cabbages at the green market. They were about three times the size of brussels sprouts and so cute I just had to take them home with me. I wasn't sure what I was going to do with them but I was pretty sure I could come up with something. One I got home I started thinking. I had some ground beef in the freezer, and once I thought of that I thought of stuffed cabbage, which was not a viable option given the size of these babies. 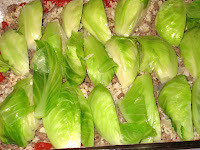 But once I went down that road, I knew those were the flavors I wanted, so why not just put the cabbages into the meat and rice mixture, rather than the other way around? Thus was born my Baby Cabbage and Beef Casserole. It's thick and hearty and the perfect dinner on a chilly Autumn night. Here's my technique. The recipe follows. 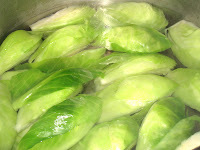 First, trimmed the bottoms of the cabbages, but did not core the. I cut them into quarters, then dropped them into a pot of boiling salted water. I turned off the heat and let them sit for 5 minutes, then drained them and placed them into a bowl of ice water so they would stop cooking and stay green. I browned the meat in a tablespoon of oil over high heat, then added onions, garlic, celery salt, salt, and pepper. I let it continue browning until the onions were translucent. Then I added the rice and cooked until it was heated through. I poured the rest of the tomato sauce on top, and sprinkled dill over that. I baked it in a 350 deg. F. oven for about 30 minutes, until the tomato sauce had browned and the casserole was bubbling. 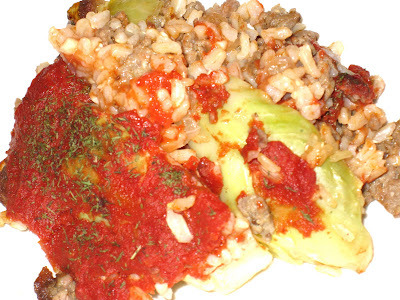 The flavors were delicious, but it would have been a more cohesive dish if I had remembered to layer the tomato sauce between the beef and rice mixture and the cabbage. Fill large stock pot with water and set over high heat. Bring to a boil; when water is boiling salt liberally. Add quartered cabbage. Cover and turn off heat. Let sit for 5 minutes. Drain and immediately place in ice water to keep it from cooking any longer. In a large skillet, heat oil over medium high heat. Add beef and cook until browned, about 5-10 minutes. Add onion, garlic, celery salt, salt and pepper and cook until onions are translucent, about 5 minutes more. Add cooked brown rice and mix well. Continue to cook until heated through. Preheat oven to 350 deg. 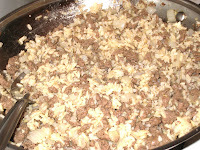 F. Pour beef and rice mixture into the bottom of a 13 x 9-inch greased baking dish. Pour half of the tomato sauce over the beef and rice. 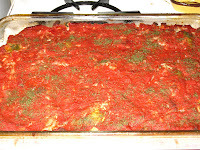 Layer the cabbage quarters over the tomato sauce, and then pour the rest of the tomato sauce over the top. Sprinkle with the dill. Bake for 30-45 minutes, until the top is browned and bubbly.